On Monday February 13, a group of students and community members gathered for a presentation by Délice Mugabo. 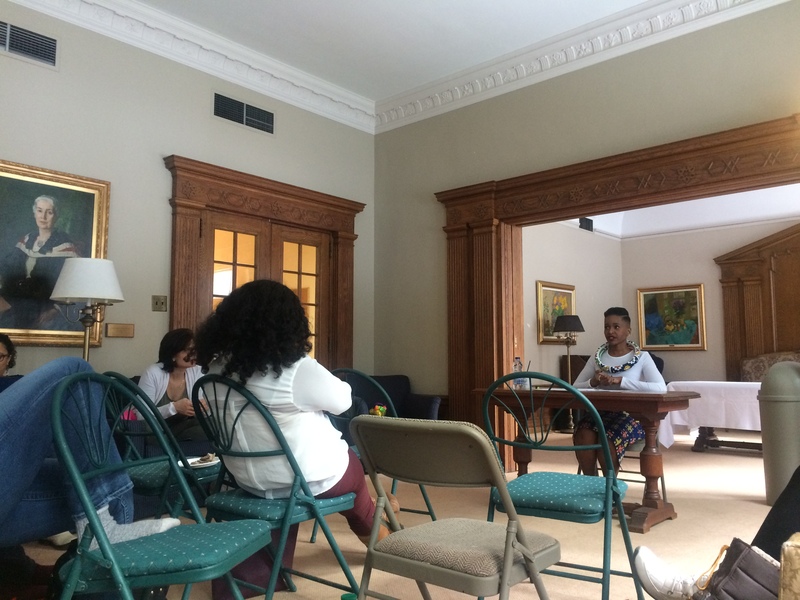 Mugabo presented part of her research: “On Haunted Places: Encountering Slavery in 1990s Montreal.” The presentation was followed by an extended discussion focusing on the intersecting themes of Mugabo’s research. Mugabo opened the panel by detailing the experiences of three Black people living in Montreal in the 1990s: Mireille Romulus, Pierre Moncius Étienne, and William Kafe. All three had faced some sort of violence while living in the city. Romulus, a Haitian-born mother of two, was in her Longueuil apartment when two white male police officers busted in “on the pretext that her sister had an unpaid bill for $425 at the Simpson’s department store.” After handcuffing her, one of the officers choked her on the kitchen floor, then kicked and slapped her. After handcuffing her, one of the officers choked her on the kitchen floor, then kicked and slapped her. Mugabo continued the discussion by recounting the violence perpetrated against Étienne, a 47 years-old Haitian father of two, when he was waiting for the bus inside the Pie IX subway station. As a result of his severe injuries, Étienne spent several weeks recovering in the hospital and was fired from his job as a result. Mugabo finally then went on to present the experiences of Kafe, an East Montreal teacher who immigrated to Quebec from Guinea. “Having endured fifteen years of racial attacks from students at the Deux Montagne school board, the 54-year-old teacher submitted a complaint to the Quebec Human Rights Commission in 1992,” Mugabo explained. The children also repeatedly told Kafe that he was supposed to be their slave, not their teacher. Mugabo argued that these events illustrate how Black people today are haunted by slavery, even 184 years after its abolishment in Quebec. She also called attention to the lack of acknowledgement of the existence of slavery in Quebec and how that denial seeks to eradicate the experience of Black Quebecers. “This province continuously denied or minimized its history of slavery,” she said, emphasizing that many in Quebec privilege Canadian slavery by claiming it was better than in the United States. “Slavery in Quebec is said to be nicer because they were given Christian names, they were baptized,” Mugabo said. “Whatever numbers we have, we did the same exact things that the United States did […] you still enslaved the first Black people who came here. Your framework for understanding Blackness was identical to the United States,” Zellars concluded.